The details in this piece are for all practical purposes public, if you know where to look. Knowing where to look seems to be a rather tedious process, in large thanks to the swathes of misinformation, and sometimes even intentional signal sabotage. But it is all there. Do your own research. The basic mechanics of Bitcoin can be found in the seminal Bitcoin whitepaper. But further to that, many of the inventor’s own writings add to its contextual basis, and offer clarity to not only the decisions made in the original Bitcoin protocol, but also the functional capability of the code which enabled things like instant transactions with better than Credit Card fraud proofs, and programmable money. It’s easy to nit-pick and take what we think sounds good. But the design of Bitcoin is clear. It was always intended to be peer to peer cash, with its overarching protocol design locked down. It was designed to be a payment system that revolutionised the ease of use in which payments could be made. Imagine a type of programmable money, that sits on a publicly verifiable ledger, that is incorruptible in its nature, with a fixed supply, and a mathematically sound emission rate. This is the Bitcoin that Satoshi Nakamoto created over a decade ago. Perhaps it’s understandable. Bitcoin in its intended stable form is powerful enough to revolutionise the entire world for the better. Sound global money, that, with an intact protocol, cannot be corrupted by any single government, company or individual. But instead of embracing a positive change, we watched as major players in the financial industry demonstrated a substantial fear of change. Blockstream is a company founded in 2014, funded by high profile investors including AXA which invested $55m alone in 2016, sought to employ a large number of Bitcoin developers to work directly on the protocol itself. Sure enough, many Bitcoin Core developers were on Blockstream’s payroll. The problem with a single company having such disproportionate large stake in the development of a protocol which is meant to be stable, presents a dangerous vector. Google defines “Crony capitalism” as an economic system characterized by close, mutually advantageous relationships between business leaders and government officials. In the Bitcoin world, the governance of the system, is the protocol itself. So here we have, a for-profit organisation, that seeks to profit from Bitcoin by altering its development roadmap to serve the purposes of the company. What purposes are they? So how can Blockstream profit from Bitcoin transactions if transactions on Bitcoin are virtually almost-free (micro-cent transactions)? To understand Blockstream’s role in hijacking the intended roadmap for Bitcoin, we have to understand a few things about how Bitcoin works. Satoshi defines a coin as a “chain of digital signatures” which lie on-chain (the public ledger). When transactions occur on-chain, it keeps the system honest, and accountable, because everything is immutably recorded on the ledger. This open system is still able to maintain individual privacy for the ordinary user. By the inventor’s own definition, you use Bitcoin when transactions happen on the blockchain. To take things off-chain, you are effectively no longer using Bitcoin. But this is precisely what Blockstream’s business model intends. And so we circle back to topic of crony capitalism. In order to sell off-chain transactions to users, the fees for transactions that are on-chain have to be substantially higher than their off-chain model. And this is where BTC fell apart. 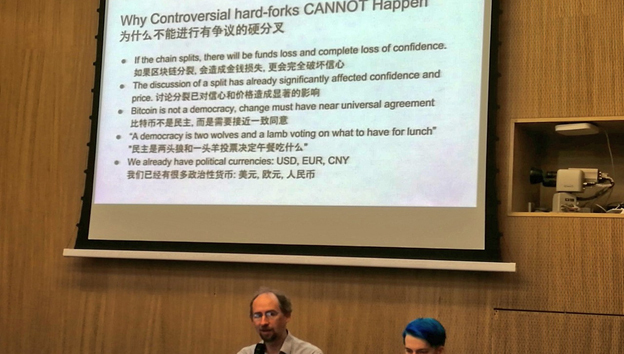 In order to force the on-chain fees to go up, Bitcoin Core developers, under the leadership of Blockstream, sought to limit the transactional throughput of the Bitcoin blockchain. What was supposed to be a temporary “flood-proof” measure implemented by Satoshi Nakamoto, ended up being a central argument for Core developers to ensure that Bitcoin was incapable of transmitting more than 7 transactions per second globally. The strain on throughput was not for any infrastructure reasons. It was purely artificial. The consequence of this, meant that to get your transaction processed, you would have to pay a higher transaction fee than anyone else at the time, creating a double blind auction, with chaotic wait times. At the height of BTC’s last investment hype cycle in 2017, fees per transaction went well above $50 USD per transaction. Thankfully, in the aftermath, with very few people using BTC again, the fees have come all the way back down. And that comment is drooling in sarcasm if you couldn’t pick it. There is nothing revolutionary or ground breaking about a system that chokes and charges 50+USD on every single transaction. 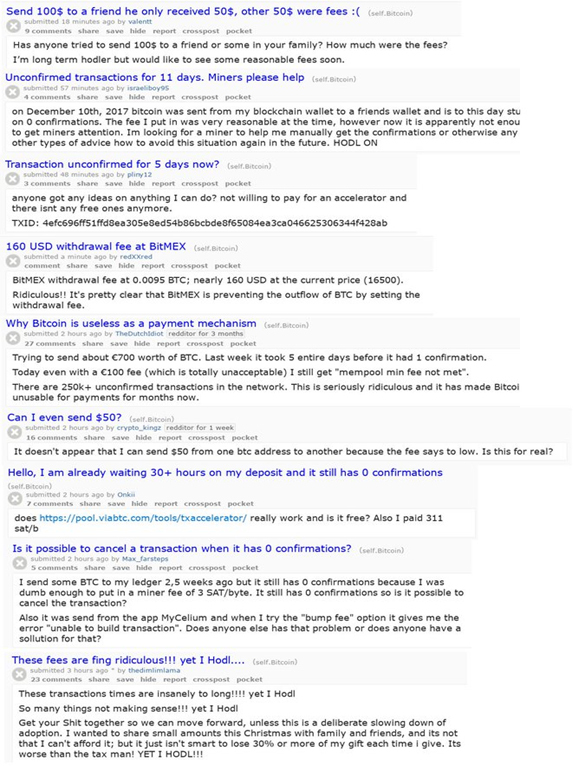 Pictures speak a thousand words, and below we have the evidence (from online message boards) of the panic that ensued as BTC came to a grinding halt. Consequently BTC lost half its global market cap to other coins. Blockstream’s answer is for everyone to use an off-chain network called “Lightning Network”, which by majority accounts, is a user experience nightmare. To move money to the Lightning Network, you ‘still’ have to pay an expensive on-chain transaction fee, and to settle, you have to do the same again. Not to mention the requirement for an always online node, and many other pain points that are beyond the scope of this piece. Suffice to say, it doesn’t work in mainstream commerce. Take transactions off-chain, and you have lost all the benefits that come with blockchain. Year after year, we have conferences and groups all over the world, talking about the benefits of blockchain. Ask yourself why would we implement economic measures that prevent people from using it? No other blockchain project in the crypto-verse seeks to do this but BTC. Bitcoin Core developer meddling with the Bitcoin protocol did not stop at that. BTC also introduced a number of radical changes including Segregated Witness (SegWit) which substantially modifies a key tenet of Bitcoin (the very definition of a coin as a chain of digital signatures) expressed in the Satoshi whitepaper, and RBF (replace by fee) which literally killed the viability of ‘instant’ transactions. You would be forgiven for thinking every change introduced happened to be a commerce killer. It doesn’t take a genius to understand that without commerce, Bitcoin is dead. Interestingly enough, Bitcoin’s logo was present in countless bars, pubs, cafes in 2014 and 2015. All of these businesses had to revert once the fees shot up. Today, instead of seeing bars accepting Bitcoin, we see them accepting an array of other digital tokens such as DASH and Litecoin. 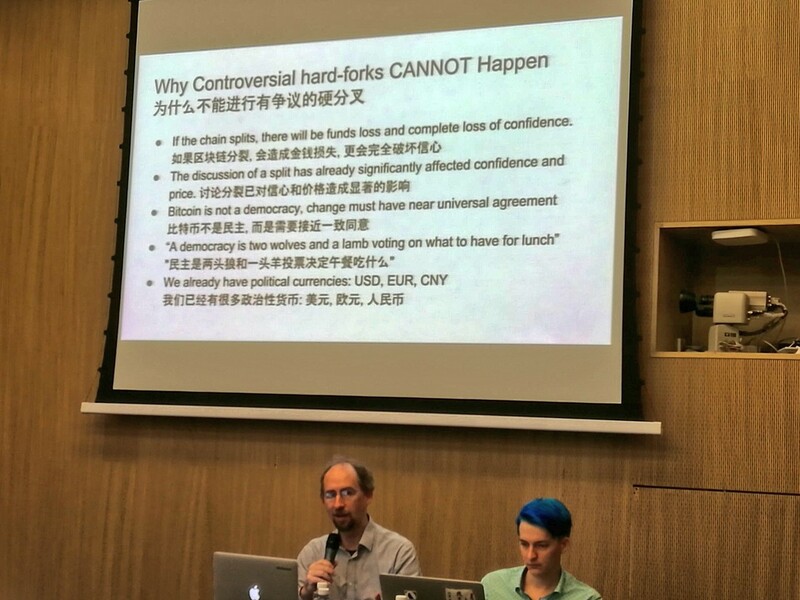 Prior to BTC splitting with BCH, and then BSV, Blockstream would very much argue against any splits. A split that preserves the original protocol, would of course bring light on both the capability of the original implementation versus the disaster of the hijacked edition. But the split was necessary to preserve Satoshi’s reference protocol. First it was saved in the BTC/BCH split, and then in the BCH/BSV split. nChain who lead the development of BSV, have categorically stated their intention to lock down the protocol. This has become a gruellingly vital move. Particularly given the number of times crony developers have surfaced to implement changes to the detriment of a free market. For example, we can look at Ethereum’s recent agreement to change its proof of work (mining) algorithm in order to kick out ASIC miners. ASIC miners are simply, application specific miners that have risked a legitimate investment in order to have a solid return. Now, Ethereum developers are seeking to change the protocol to the detriment of those miners. Think on this for a moment, and how this impacts free markets, trust, and confidence? Now, what enterprise company would seek to build their application on such a platform? What happens when developers deem you to be a threat, or believe you have become grown too fast too quickly? At the height of the hashwar between BSV and BCH, the developers of BCH, implemented secretive changes to the code that were only known to a handful of entities. This move was intentionally designed to kill off the competition from a competing implementation. This sets the same precedent as Ethereum does. A mutable protocol, actually works directly against the very definition of protocol. Protocols are meant to be secure, strict, and in agreement. It is these back-room deals that Bitcoin was supposed to put an end to. Core did this, and ABC did this. It is for this reason, the protocol needs to be stable above all else. It would be wise for the Bitcoin ecosystem to collectively condemn any changes to the protocol for the benefit of a player in the ecosystem. It is for this reason, that Satoshi Nakamoto openly stated that the design of Bitcoin should be locked. Only in the interest of bug fixes and critical issues should we consider major changes, and only after significant analysis, tests, data, and miner consensus. Why? Because this is the only chance Bitcoin has of surviving take-overs. It is for this reason, that among Satoshi’s early writings there exists this note: “the nature of Bitcoin is such that once version 0.1 was released the core design was set in stone for its lifetime”. While nChain like any other company receives criticism for its mode of operation, it can without a doubt be categorically stated, that the company’s adherence to the original Bitcoin protocol implementation absolves it from any possibility of manipulating the protocol for illegitimate or unfair gain. There can only be one legitimate protocol for Bitcoin: Satoshi’s implementation protocol (minus the bugs). The vast majority (not all) of everything else done in the name of changing the protocol has always been some entities’ self-serving need. This isn’t how protocols work. It is for these reasons, that Bitcoin SV (BSV) remains the sole legitimate custodian of the Bitcoin title. Today, this original protocol has gone head and shoulders above the competition in its scalability efforts. It is the only Bitcoin implementation, with a throughput capacity that far exceeds PayPal’s daily throughput, and is quickly establishing itself as a stable foundation in which to build business applications. This is a fact. The Bitcoin SV Scaling Test Network (with test results published on the website bitcoinscaling.io) has already proven that Bitcoin SV is capable of handling the highest throughput among all the major proof of work based competitors. (Recent test results showed 36 hours of continuous 128MB blocks which equate to well over 30 million transactions a day). The original Bitcoin implementation was far more powerful than anyone had previously even guessed and some observers are beginning to take notice. Today BSV is building its Metanet (where the Bitcoin blockchain will subsume and power the Internet), it is completely capable of git like systems all on-chain. It allows for the construction of immutable applications, which serve as God-send to any developer… It enables business. No business will build on shaky, or mutable foundations. A fixed protocol that does not bend to the whims of crony organisations, creates an air of legitimacy, and removes risk. The only legitimacy comes from a stable protocol for stable, sound money.